One of the most common mistakes that is made during any home improvement, remodeling or construction project is using the wrong size extension cord (Figure 1) to supply electricity to power tools. This mistake is made be contractors and home handymen alike. 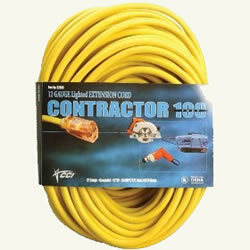 Selection of outdoor extension cords . Selection of indoor extension cords . Using undersized, by gauge of wire, extension cords, is a sure way to burn out power tools and other electrical devices. The thinner the wire in the extension cord, the higher the resistance, and the more power that is lost in the extension cord itself, rather than being delivered to the power tool. convenience - it is the extension cord that is readily available. the smaller the wire size, the less expensive the extension cord. Table 1 provides an indication as to the amperage draw of common power and gardening tools. This table is meant to be a guideline only and one should read the exact amount of power required on the power tool or electrical device label. Table 2 provides the maximum length of extension cords, for a specific wire gauges. If it is necessary to run an extension cord farther than 100 feet than you should go up one wire gauge size.